Why not improve your computer experience by expanding your screens? Perfect for research on one panel and working on the other panel, either for the home or work. These stands, with the correct screens and dual screen capability graphics, doubles your viewing area. We can help with setting up the units, or if want you can simply order a stand from us and you can setup the rest. The stand shown here (dual) is £112.44 plus delivery and VAT. BCS also stock triple and quad screen stands – for all kind of usage from security solutions, gaming stations or just the sheer wow factor in a waiting room or reception of a business. There is also a triple shown below, with some specs. Please call for pricing. Monitor Capacity: 3 x 14 kg Rotation TFT: +/- 90° VESA attachment: 75 or 100 mm. Description: Optimal data across multiple monitors. 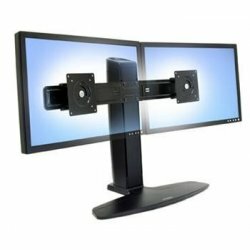 With this holder you can align 3 monitors up to 21 “comfortably for optimal viewing angle to the user. Thanks to the parallel use of multiple screens, you no longer need cumbersome jump between open applications. There a great video review to show you the type of product and also the installation. This entry was posted in Hardware Review, PC Support. Bookmark the permalink.